After encountering heavy Soviet tanks such as the KV-1, it rapidly became apparent that the Pak 36, which formed the bulk of the German AT guns at the start of Operation Barbarossa, was inadequate. To counter the threat these tanks posed, heavier guns were introduced to the front, including the 7.5 cm (3 inch) Pak 40 and, more importantly, the 88 mm (3.5 inch) Pak 43. The 88 mm (3.5 inch) Flak, on which the Pak 43 was based, had been used in ground support since the Spanish civil war and had proven to be very proficient at taking out tanks. So it’s no surprise the decision was made to mount it onto a tank chassis. The resulting tank was the Hornisse (later known as the Nashorn), which had a Pak 43 mounted onto a Panzer III/IV chassis. Despite having a high silhouette and very little armor, it proved more than adequate, being able to take out tanks at ranges of over 3000 m (3280 yards). Another tank destroyer using the Pak 43 was the Ferdinand (later known as the Elefant). After losing a design contract to Henschel, Porsche had 100 Tiger P chassis which couldn’t be equipped with the Henschel turret, since they were reserved for the Henschel Tiger tank. In 1942, the order was given to convert the remaining chassis into tank destroyers, which were to use the Pak 43. The Ferdinand first saw use in the Battle of Kursk, where it could easily take out enemies from long range. But when it advanced, the flaws became apparent. The lack of close range defense made it an easy target for Soviet infantry, which could near the tank and throw Molotov cocktails and grenades at the tank. Its heavy weight also made it difficult for the tank to cross most bridges of it’s era, and the poor Soviet infrastructure made navigating near impossible in certain places. It became clear that the German army was in need of a tank destroyer that offered decent mobility without sacrificing armor, and vice versa. And as such, the Jagdpanther came to be. 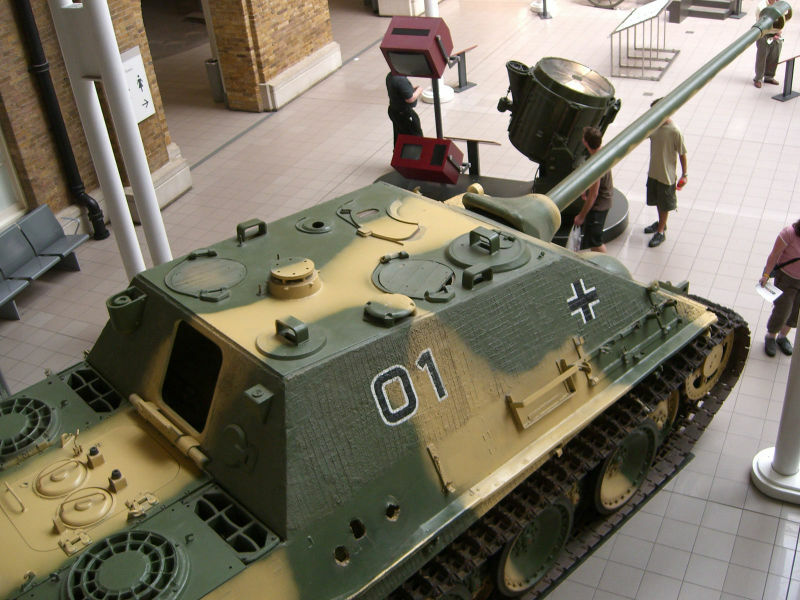 The Jagdpanther is one of the most iconic tank destroyers of World War 2. Based on the Panther chassis, the famous tank destroyer was produced from 1943 up until the end of the war in 1945. Mechanically more reliable than the Ferdinand/Elephant and the Köningstiger, armed with the 88 mm (3.5 inch) Pak 43 “Panzerknacker” and with up to 100 mm (3.9 inch) of frontal armor (on the mantlet), it was a formidable opponent for any tank at the time. During the war, over 400 tanks were produced, seeing action on both the Eastern and the Western European fronts. 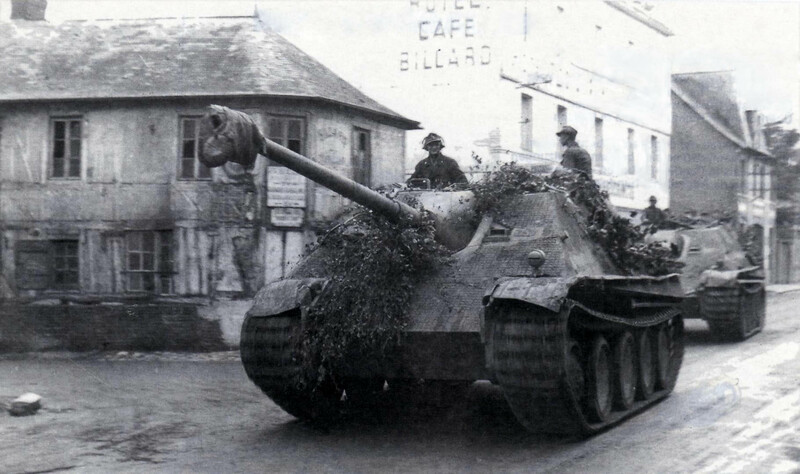 After the war, captured Jagdpanthers were used by the French army, along with Panthers and other German tanks, up until the 1950’s. Overall,the Jagdpanther was a great mix of mobility, firepower and armor. Today, only 10 of the tank destroyers are left, spread across various museums worldwide. When the Pak 43 was designed, it was originally meant to be towed into battle, but it soon became clear that the anti-tank gun was very unwieldy to transport in the field. As a result, the Wehrmacht started looking for a self-propelled platform to mount the 88 mm (3.5 in) gun onto. The solution was found on August 3rd, 1942, when the Heereswaffenamt (the agency in charge of R&D for the German army) decided to mount the Pak on a Panther chassis. Krupp was awarded the design contract, but was unable to deliver the design drawings by January 1943, and so the project was handed over to Daimler-Benz. Krupp, however, remained responsible for the production and delivery of the Pak 43, the main armament of the Jagdpanther. In the first designs, the tank was named the “88mm Sturmgeschutz” and later came to be known as the Sd.Kfz.172. The final design was presented to Hitler on his birthday, and subsequently accepted by the Heereswaffenamt in May 1943. As production started on the first models of the Jagdpanther, it became apparent that there was a shortage of workspace in the Daimler-Benz factory. That, combined with Daimler-Benz not being able to produce the contracted amount of Panthers, lead to production being handed over to MIAG, a Braunschweig based company. A pre-production model was presented to Hitler on the 20th of October, alongside a model of the Tiger 2 and the Jagdtiger. 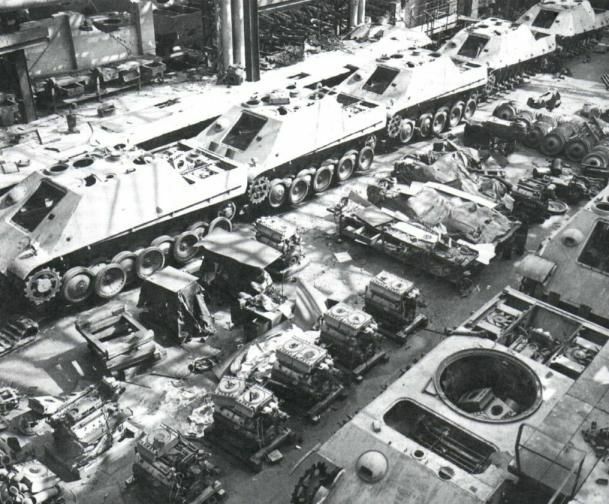 November that year, mass-production of the Jagdpanther was authorized. The first Jagdpanther meant for service was delivered in December 1943, with production increasing to 10 tanks per month in April 1944. Delays in production were mainly due to improvements being implemented. Strengthened gearboxes and intermediate gears were installed. Jagdpanther production was also slowed down due to bombing raids and lack of workmen. By the end of June 1944, only 46 of the tanks had left the factory floors, barely enough to equip one Schwerer Panzerjäger unit. This was far from the original 160 planned vehicles, which would have been enough to equip 3 units and have some left for testing and training. The MIAG firm complained about the lack of workmen, and as such was sent 320 men from the Panzerjäger replacement unit. This managed to boost production to 20 tanks a month in September 1944. Neither the OKW, nor the Heeresamt were happy with the production numbers and, as a result, two other companies, MHN & MBA, were contracted to produce the Jagdpanther. This increased the total output to 67 tanks for December 1944. The Jagdpanther was equipped with the fearsome 88 mm (3.5 inch) Pak 43. Based on an anti-air gun, the 88 mm (3.5 inch) soon turned out to be more than adept at taking on an anti-tank roll. Accurate at over 3000 m (3280 yards) and with a muzzle velocity of over 1000 m/s (3280 ft/s), the 88 mm (3.5 inch) gun has more than earned its reputation as one of the best anti-tank guns of the war. The Pak originally featured a monobloc barrel, but due to the rapid wear of the high-velocity gun, the decision was made to replace it with a dual piece barrel. Although this didn’t reduce wear, it did make replacement easier. The main gun was able to fire different shells, ranging from the armor piercing PzGr. 39/43 and PzGr. 40/43 to the high explosive Gr. 39/3 HL. The Jagdpanther carried 60 rounds of 88 mm (3.5 inch) ammunition, 1200 rounds for the coax hull-mounted gun and two MP40’s with 384 9×19 mm rounds. With the introduction of the Nahverteidigungswaffe (close range defense weapon), it was possible to launch projectiles near the tank without endangering the crew, and so 16 grenades were added to the inventory. However, this weapon couldn’t be built into most of the Jagdpanthers before June 1944, due to a shortage of the weapon. As a result, earlier models of the tank have the opening in the roof sealed with a circular plate which was held by screws. 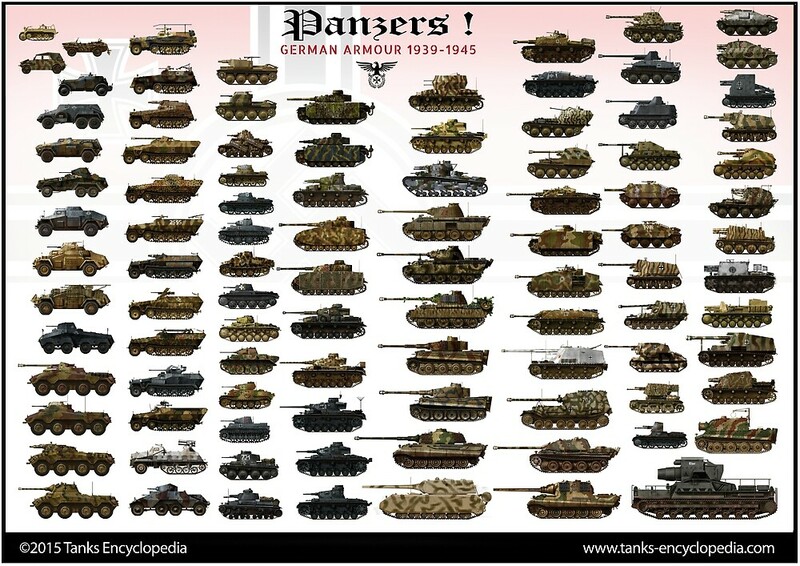 As the Germans improved their armor, so did the Allies. As the war progressed, bigger and heavier guns were being developed by the Allies, capable of shooting shells of ever-increasing penetration. To counter this, tanks were designed with thicker and sturdier armor, with the Jagdpanther being no exception. Meant to be able take on other tank destroyers, the Jagdpanther’s frontal upper armor was a single, 80 mm (3.15 inch) thick wall of steel under an angle of 55°, with the lower frontal armor being 60 mm (2.35 inch) at an angle of 60°. This resulted in a formidable effective armor thickness of ~140 mm (5.5 inch) for the upper plate and ~90 mm (3.5 inch) for the lower plate, guaranteeing protection from all but the heaviest of guns. The gun mantlet was just as tough as the frontal armor of the Jagdpanther. A 100 mm (3.9 inch) thick ‘saukopf’ (pighead) mantlet was installed on the gun. The sides of the superstructure of the tank had 50 mm (1.97 inch) of armor, while the lower sides had 40 mm (1.57 inch) of armor. The roof and the floor were between 16 (0.63 inch) to 25 mm (1 inch) thick. The production model of the Jagdpanther weighed in at 46 tonnes, making it one of the heavier tanks fielded by the German army. The drive train was the same as the Panther aside from the engine and the heavier transmission. It was powered by a 12 cylinder Maybach HL 230 P30 23.1 liter V12 gasoline engine, which would give it an effective range of 160 km (100 miles) and a top speed of 46km/h (28.6 mph), making it as fast as contemporary Allied medium tanks such as the M4 Sherman, despite the latter weighing 15.000 kg (33070 lbs) less. Inside the Jagdpanther there was a 5 man crew consisting of the commander, driver, gunner, loader and radio operator, with the latter doubling as machine gunner. The two hatches at the top of the tank were for the commander and the loader, with the hatch at the back serving as an entrance for the crew and to replenish ammunition. On early models, the driver used two periscopes to see ahead, and 5 pistol holes which could also be used to observe the surrounding battlefield, but the latter soon turned out to be more detrimental to the strength of the armor. In later models the holes were removed and the left periscope was welded over, being filled with a 15 mm (0.59 in) thick plate. The commander and loader had four periscopes available to survey the surrounding area, two rigid, and two capable of turning. The Jagdpanther was provided with a 10 Watt Fu 5 transmitter and a 2 Watt Fu 2 receiver radio. Command vehicles received the long range 30 Watt Fu 8 radio set. As the war went on, several additions and adjustments were made to the Jagdpanther. January 1944: The pistol ports , which weakened the overall hull strength and had become unnecessary with the installation of the Nahverteidigungswaffe, were removed from the tank. February 1944: The left driver periscope was removed and welded shut with a 15 mm (0.59 in) piece of steel and a towing coupling was welded to the back servicing plate. To make space for this, the winch was moved up to between the exhaust pipes. Earlier Jagdpanther still used the Panther Ausf.A engine cover, with the difference being the air intake was made smaller to fit on the tank destroyer. Where the Panther’s radio antenna was attached to the hull of the tank, the Jagdpanther’s antenna was mounted on the back of the superstructure, next to the rear hatch. This left a hole in the engine cover, which was covered with a screwed-on plate. May 1944: The monobloc gun was replaced with the two-piece gun, facilitating replacement of the worn barrel. June 1944: A mount for a small 2-ton crane was planned for the roof of the vehicles. The gun mantlet was changed so that a screw was at the top of the cast piece. Note the ‘mushroom’ crane mount towards the back of the casemate, and the Nahverteidigungswaffe to the front and left of it. September 1944: The OKH ordered manufacturers to stop using the Zimmerit protective coating on the tanks. October 1944: Sheet metal pipes were installed over the exhaust, on the account of them glowing at night, possibly giving the tank’s position away. The leading wheels of the Jagdpanther didn’t clean themselves, and as mud and snow gathered, tracks got thrown. New leading wheels of a bigger diameter were developed, reducing the amount of tracks thrown. December 1944: The Jagdpanther started using the new type of engine cover provided for the Panther and “flame-destroyer” exhaust mufflers are installed, preventing mixtures of fuel and air in the exhaust from igniting. In late 1944, plans had been made to mount the 128 mm (5.04 in) Pak 80 onto the Jagdpanther chassis. The new vehicle, known as the Jagdpanther mit 12.8 cm PaK 80, would have had a rear-mounted casemate and weighed in excess of 50 tonnes. The project never got past the blueprint phase and got shelved before the war ended. The Jagdpanther mainly saw action one the Western front from its deployment in March 1944, with deployment to the Eastern front only occurring from January 1945 onwards. The first unit to receive the new Jagdpanther was the schwere Panzerjäger-Abteilung 654. Each Jagdpanther Kompanie was scheduled to receive 14 of the tanks destroyers, and an additional 3 command tanks for the battalion headquarters. Due to production problems, it wasn’t possible to bring the 654th to full strength before being sent to the front in June, 1944. The first action the Jagdpanthers saw was on the 30th of July, when they engaged a squadron of Churchill tanks near St. Martin de Bois. 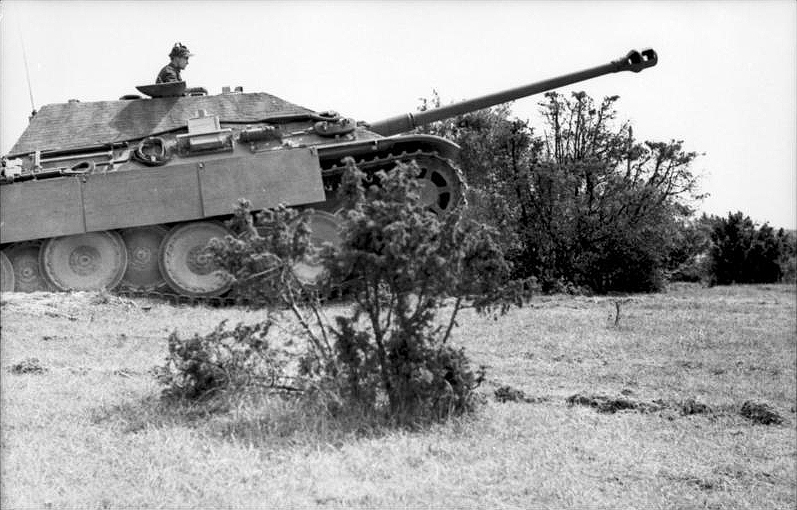 In a two-minute action, three Jagdpanthers managed to take out eleven Churchills, before an additional squadron of Churchills rushed in to help. The 6th Guards tank brigade reported the capture of two Jagdpanthers, which had been left behind due to track damage. Nonetheless, this encounter showed the strength of the new tank destroyer and helped cement its reputation as a threat to any tank that encountered it. Early Jagdpanther, sPzJgAbt 654, France, Normandy, summer 1944. Jagdpanther (early type) of sPzAbt 654, France, spring 1944. Jagdpanther, 1st companie, schwere Panzer Abteilung 654, Ruhr pocket, March 1945. Early type Jagdpanther attached to the 19th SS Panzerdivision, 1944. Jagdpanther of the Führer Grenadier Brigade, Panzerdivision Grossdeutschland, fall 1944. Jagdpanther of the sPzAbt 654, Normandy, summer 1944. Late type, schwere Panzerjäger Abteilung 654, Normandy, France, summer 1944. Jagdpanther, late type, unknown unit, France, winter 1944. Jagdpanther, 1st Companie, 560th Heeres Schwere Jagdpanzer Abteilung DomBütt, Ardennes, 20 December 1944. Jagdpanther (unknown sPzAbt), Ardennes, December 1944. Jagdpanther of the sPzAbt 654, Ruhr area, March 1945. Jagdpanther (unknown sPzAbt), Eastern Front, early 1945. Unknown unit, Eastern Front, 1945.
the Jagdpanther, 1st Companie, 560th Heeres Schwere Jagdpanzer Abteilung DomBütt, Ardennes, 20 December 1944. do you happen to have the camo scheme for the other sides? Great article, my favorite tank of all time! Many people love the Jagdpanther. However, while it was a good vehicle, too few were built too late. The caption under the fourth picture of Jagpanther “Early type Jagdpanther attached to the 19th SS Panzerdivision, 1944” cannot be right. There never was a 19th SS Pz Div. Other information sources indicate that the 9th SS Panzer Division received Jagdpanthers, but not the 19th SS. My guess is that the 19th is a misprint and should read 9th. “Jagdpanther of the sPzAbt 654, Ruhr area, March 1945” (4th from the bottom) doesn’t have the upper tracks, it reaches the front drive sprocket and ends there. Some said the Jagpanther was better than the vehicle it sprang from. Hard to argue with. “… Maybach HL 230 P30 23.1 liter V12 gasoline engine, which would give it an effective range of 160 km (1000 miles)…” – 160 km does NOT equal 1000 miles. the Jagdpanther page. Not sure about any others, but just wanted to let you know! Fixed, thank you sir ! Under Mobility It says that the effective range is 160km( 1000 miles). It would be good if you fix that typo. Awesome typo, fixed, thanks ! Where are the crew located? Left side, driver, gunner, commander, front to rear. Right side, machine gunner/radio operator, loader. So is it a KwK 43 or a Pak 43? Make up your mind. The article keeps calling it a KwK, the infobox says Pak. Wikipedia says Pak, although one could also argue it ought to be a Stuk. I am personally not convinced; the KwK 43 that was designed for the Tiger II was intentionally modified to give it a shorter recoil cylinder. It is easy to see the recoil cylinder under the barrel of the Pak 43 on the Nashorn, but not on the Jagdpanther, which suggests it uses the same gun as the Elefant and the Tiger II, the KwK. They redesigned and redesignated them for a reason, because they were better suited to use in a vehicle than the Pak. The Pak worked in the Nashorn because it’s just an AT gun mounted on a tracked chassis. Pak 43, fixed all over the article. Nope, can’t argue it’s a StuK, this is definitely not an assault gun. Also, each gun has variants due to the various improvements and adaptations made. The one on the Jagdpanther was the Pak 43/3.